Home » »Unlabelled » Enter to Win a HELLBOY Prize Pack! 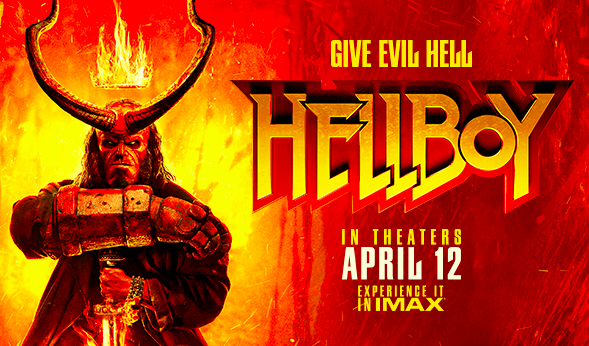 Enter to win a Hellboy Prize Pack, including a pair of ATOM tickets, t-shirt and hat, good for Washington DC. Hellboy is back, and he’s on fire. From the pages of Mike Mignola’s seminal work, this action packed story sees the legendary half-demon superhero (David Harbour, “Stranger Things”) called to the English countryside to battle a trio of rampaging giants. There he discovers The Blood Queen, Nimue (Milla Jovovich, Resident Evil series), a resurrected ancient sorceress thirsting to avenge a past betrayal. Suddenly caught in a clash between the supernatural and the human, Hellboy is now hell-bent on stopping Nimue without triggering the end of the world.